Bollards or post barriers have many purposes. Everything from securing boats and ships to docks, protecting fences and buildings from errant trucks and forklifts as well as prohibiting and directing motor traffic. Bollards can be permanent or removable pertaining to each peculiar situation. Rustic Fence can supply and install whatever type of bollard is needed for each customer’s specific need. Commercial bollards are built to the highest commercial standard so that you can effectively protect your property. We craft and install these bollards according to your exact specifications and desires so that you never have to worry again. When installing posts, you want to trust that they will stop the force of a car, boat, or other high-speed machines. Our posts are made using the toughest and most reliable steel, and our expert crew will install it according to the highest safety standard. Guardrails are essential for many factories, warehouses, and other commercial areas. However, you need to use only the strongest guard rails that are installed with expert care to ensure that they keep you, your employees, and your investments safe. 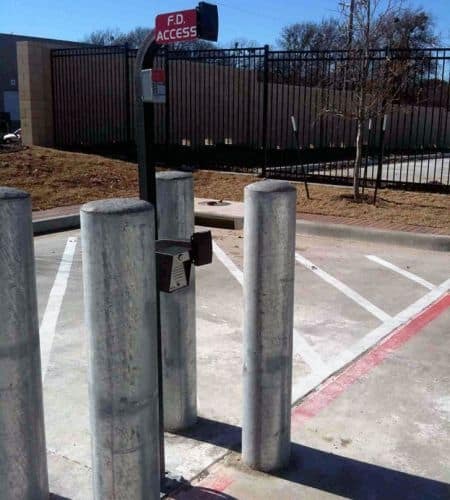 Ask us about bollards and our safe installation.